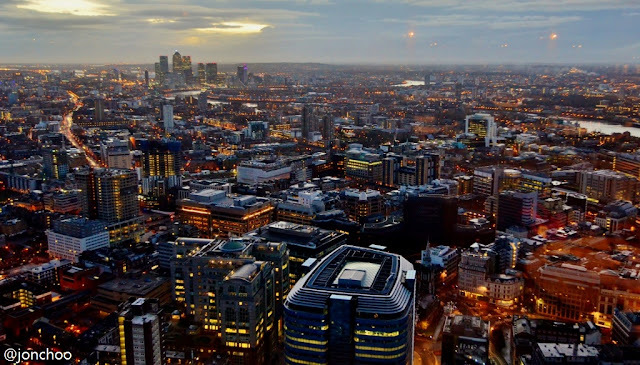 Duck & Waffle is a new experimental fusion restaurant on the 40th floor of Heron Tower in Bishopsgate, London. One of the few venues in London that offers even us plebs a chance to dine 180 metres above ground, it is also surprisingly good value. In other countries, we may scoff at the idea of dining more than 50 metres above sea level as anything special. No thanks to London's archaic planning permission law, you get very few choices here. Despite being opened 24 hours a day, booking is recommended, particularly for peak times (lunch and dinner). Duck & Waffle offers four menus throughout the day. These menus also changes on a regular basis. 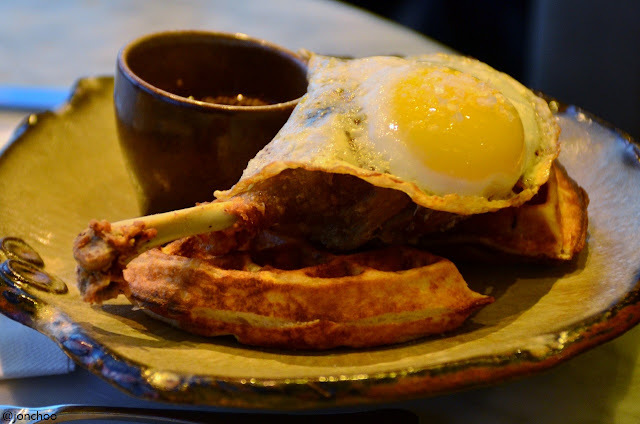 Their signature dish, if you haven't guessed already, is their namesake duck 'n' waffle, which consists of... a leg of crispy duck confit, waffle and fried duck egg. Simple, and rather neat as well. 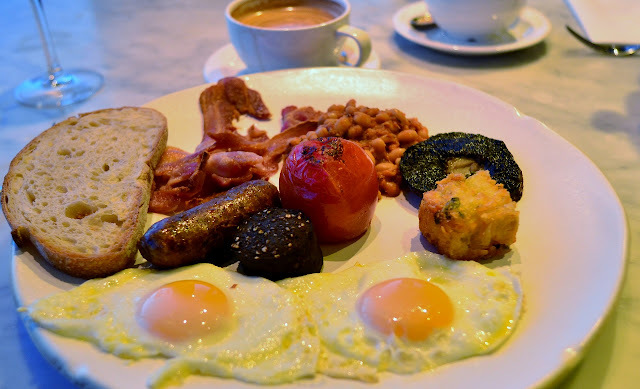 They also offer traditional English breakfast, though I am not quite convinced by the trotter braised beans. For the price, the food wasn't stunningly gorgeous, but we had little complaints apart from the coffee, which I found to be merely cafe-grade. Still it is impossible to deny the value. 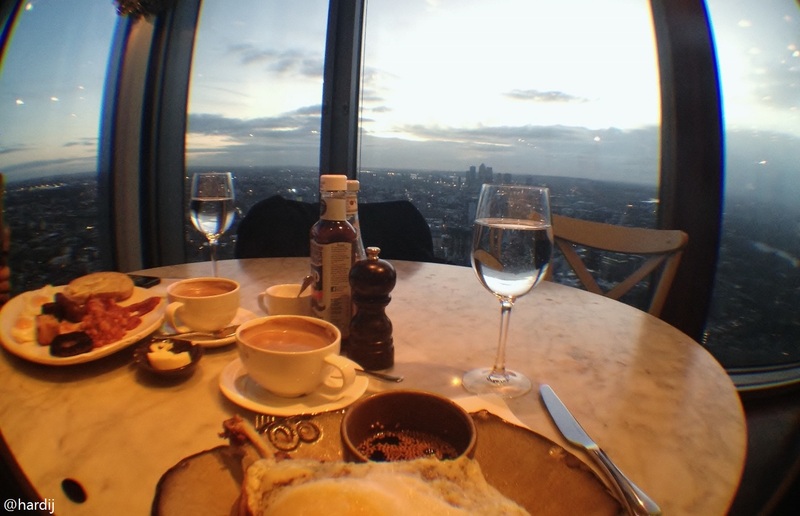 Where else in London can you enjoy breakfast at 7.30am with a panoramic view of the Gherkin, Tower Bridge and Canary Wharf? A 30 minute trip on the London Eye alone costs £17, and they won't feed you. Even the scenic west facing elevator ride was a highlight in its own right, with a top speed of 5 metres per second - that's around 35 seconds trip from the ground floor to the top. Cocktails are rather pricey, but not too outrageously over the top. They also share a bar with Sushisamba (a Japanese Brazilian Peruvian fusion restaurant) two floors below, which has two open terraces (one which is closed during the winter) overlooking north and east London. For gin lovers, the Belo Martinez with heavy Plymouth Navy Gin based is bittersweet tasty. Apart from the view, the other great thing I love about our visits to both Duck & Waffle and Sushisamba, was just how friendly the staff were, even in the wee hours of a Saturday morning. The lack of snobbery is refreshing, particularly in this part of London. Visit any rooftop terrace in, say, Shoreditch, and you tend to get the feeling that you are not welcomed there. Not here. 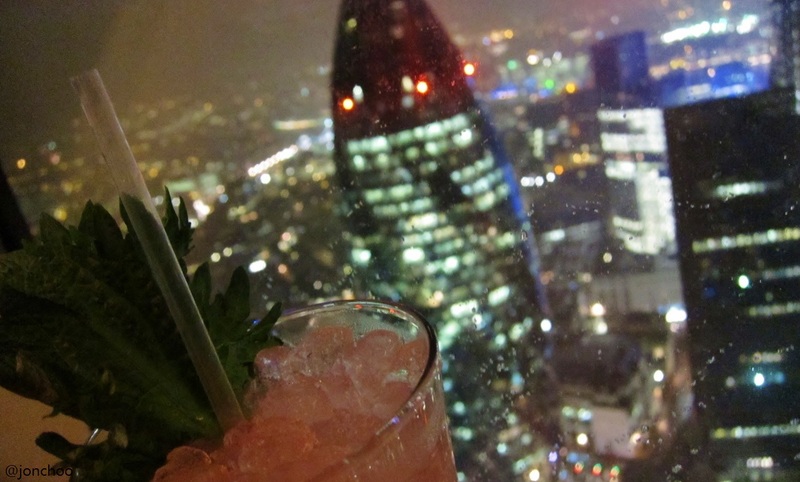 Until the Shard opens to the public and the nearby clusters of new skyscrapers such as the 'Walkie Talkie' (20 Fenchurch Street) completes, Londoners aren't spoilt for choices when it comes to cocktails with a view. The only other cocktail bars in London I can think of is Vertigo 42, which is about as accessible as Buckingham Palace, and Paramount in Soho.